In this undated image provided by the U.S. Fish and Wildlife Service, Andy Plauck, with the U.S. Fish and Wildlife Service, holds an American eel taken from the Osage River in Missouri. The Obama administration is taking steps to extend federal protections to hundreds of animals and plants, including the American eel, across the country, compelled by a pair of recent legal settlements that targeted species mired in bureaucratic limbo even as they inch toward potential extinction. MACHIAS, Maine — Late each winter, elver nets appear in the Machias River, as they do in scores of Maine rivers. Harvesters capture the eels while they are in the juvenile stage and sell them to Asian brokers, who then grow the eels in captivity to adult size and sell them as food. Elver fishing can be a lucrative business. One Machias elver fisherman bragged that he plopped down enough cash this spring to buy a new pickup truck. Elver fishermen were boasting they were catching 10 to 12 pounds of elvers a night and getting $1,200 a pound. Even though it is a small portion of Maine’s fishery, the Maine Department of Marine Resources considers elvers the state’s most valuable marine resource in terms of price per pound. But the American eel is in jeopardy, some scientists maintain, and last week the U.S. Fish and Wildlife Service announced the eel may need federal protection as a threatened or endangered species. USFWS has launched a study of the eels’ sustainability after an initial review of a petition by the Center for Environmental Science, Advocacy and Reliability, formerly the Council for Endangered Species Act Reliability. In its petition to the federal agency, the center states many reasons for the decline in eel populations, including dams and disease, but habitat loss leads the list, and Maine is a key offender. The center maintains that habitat loss has been the greatest — 91 percent — between Maine and Connecticut. Dr. Gail Wippelhauser of the Maine Department of Marine Resources has been studying Maine’s elver fishery since 1995. She said that although the demand for and harvest of eels has been high recently, it is still a very small part of the state’s marine industry. According to 2010 statistics compiled by DMR, eels are clustered in a category labeled “other” and represent less than 6 percent of all Maine marine landings — less than seaweed, crab and shrimp. Lobsters, by comparison, were 37 percent of all landings. As far as value goes, 70 percent of Maine’s marine landings value was attributed to lobster, while less than 2 percent were “other” species, which include eel. But should there be an endangered designation, Wippelhauser said, all eel fisheries in the country would be shut down. The last assessment by the Atlantic States Fisheries Commission in 2006 estimated the East Coast eel population at between 900,000 and 3.6 million. Wipplehauser said that after reading the petition filed with USFWS, she saw only one bit of new information that could affect the eel’s status. Eels are being ravaged by a parasite, Anguillicola crassus, that invades their bladders. This parasite inhibits the eels’ ability to reach their spawning grounds in the Sargasso Sea. “They simply do not have the endurance,” Wipplehauser said. Information on studies conducted this year on American eels to determine the extent of the parasitic infection were not available yet, she said. She also said information in the petition that said Maine had great habitat loss due to dams is untrue. “The petition cited a single, old source and it is my conclusion that eels go both through and over Maine’s dams,” she said. A month before the Edwards Dam on the Kennebec River in Augusta was removed in 1999, Wippelhauser said, she collected a half-million eels at Fort Halifax, upstream of the dam in Fairfield. “We never saw that many again,” she said. 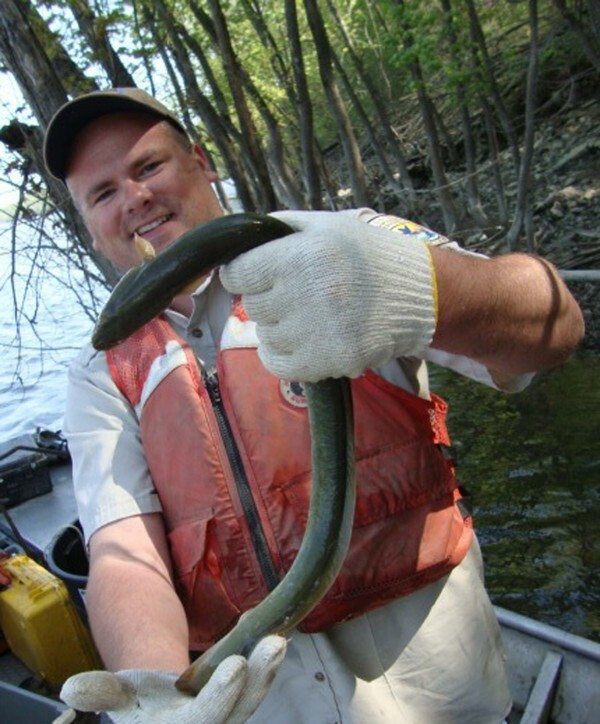 Fisheries for yellow and silver eels have a long history in Maine, beginning with the earliest colonial settlements, according to the Department of Marine Resources. The fishery was nonexistent from 1979 to the early 1990s because of a collapse in market demand for elvers, Wipplehauser said, but in recent years, the elver market has exploded. Elvers are highly valued as a delicacy in the Far East — Japan, China, Taiwan and Korea. The fishing season for elvers is restricted to March 22 through May 31 with harvest methods restricted to hand dip nets and fyke, or funnel-shaped, nets. Since 2006, new entries into the fishery have been restricted to a lottery with the total number of elver fishing licenses capped at 827.